Chloe's 1st (2007) and 2nd (2008) birthday cakes, notice that for the past two years were Pooh theme. 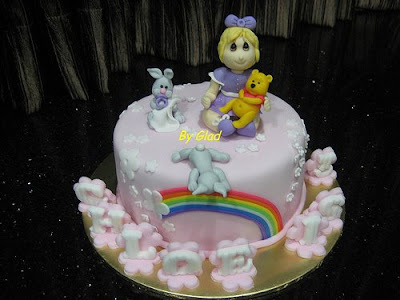 She loves Pooh & friends, this year only Pooh is around and the rest of the friends are on leave :) She is older now (tho' I have not met her personally), so I made a little girl (not baby) as topper for the cake. Her mummy specially requested rainbow as she loves rainbow!